Published as a print-on-demand magazine through Createspace and Amazon, Cirsova suffers a little from the constraints of this means of production: the spine is perfect-bound and covers—blank inside—are prone to curling. The internal layout is simple but practical, print is large, set in two columns, and with no internal illustration except for adverts. Cover art by Jabari Weathers is effective, and captures the spirit of the opening story well. A little confusingly, the table of contents is not in the same order as the stories in the magazine itself, but rather highlights the one novella (which appears last in the page-order), and sets two sea-based stories apart from the rest of the content; it might have been simpler to set these apart in the contents as well as the TOC, but perhaps this reflects recurring features that regular readers will be used to. The opening story, “The Sealed City” by Adrian Cole, is excitedly gushed about in the editorial, being a newly commissioned story in the setting of the author’s 1975–6 Dream Lords trilogy. The first thing that occurred to me on reading this deeply old-fashioned and formulaic piece, which describes humanity as “Man” (capitalization sic), was the complete absence of women. Not only are there no named or otherwise speaking/acting female characters, but the entire story could be set in a world with no women in it all, for all the mention the receive (with the exception of the faceless “acolytes of evil … naked men and women,” apparently mentioned only to highlight their depravity). Despite the rather conventional plot, tired good versus evil conflict, and predictable outcome, this piece is competently written and well-paced, a perfectly distracting if unchallenging short read. Of the other shorter stories, the one that attempts to do something interesting with its material is Karl Gallagher’s “Squire Errant,” which builds up a pompous and arrogant heroic knight to absurd lengths, and then has a village of hapless peasants save the day against the marauding dragon. Perhaps light-weight and predictable, this piece nicely offsets the glorification of military discipline with a parable that privileges footsoldiers and commoners above the vainglorious, individual heroics of noble-born knights. The last and longest story in this volume is the novella “Images of the Goddess” by Schuyler Hernstrom, a sprawling, endless adventure with cut-out characters and childish predicaments—the dénouement in particular is a cheap comic device as puerile as it is signposted thirty pages in advance. It is certainly charming, though, with engaging writing and reasonably gripping hazards and conflicts, as sheltered monk Plom seeks a holy book containing ancient images of his beloved Goddess, helped and hindered by a wizard, a warrior woman, a ship’s crew of pirates, mercenaries and giants, and a small portable computer brain. There are several other stories I have not mentioned, including one or two that are genuinely terrible, barely coherent, or relying on racist stereotype, but the content on the whole is generally coherent—neither outstandingly original nor low quality. Readers who would rather avoid any fantasy that could have been written later than the 1970s will certainly welcome this new small magazine. 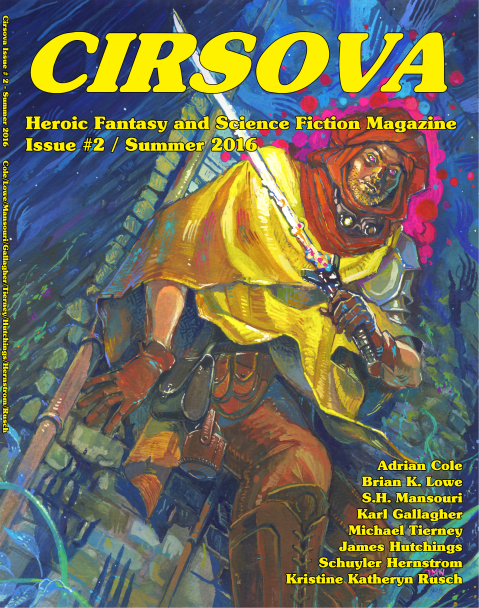 The editing is decent, the management of the publication clearly serious and competent, so we should expect Cirsova magazine to grow and flourish for some years to come. If this sounds like the sort of fantasy you write, you might like to look over the submission guidelines.